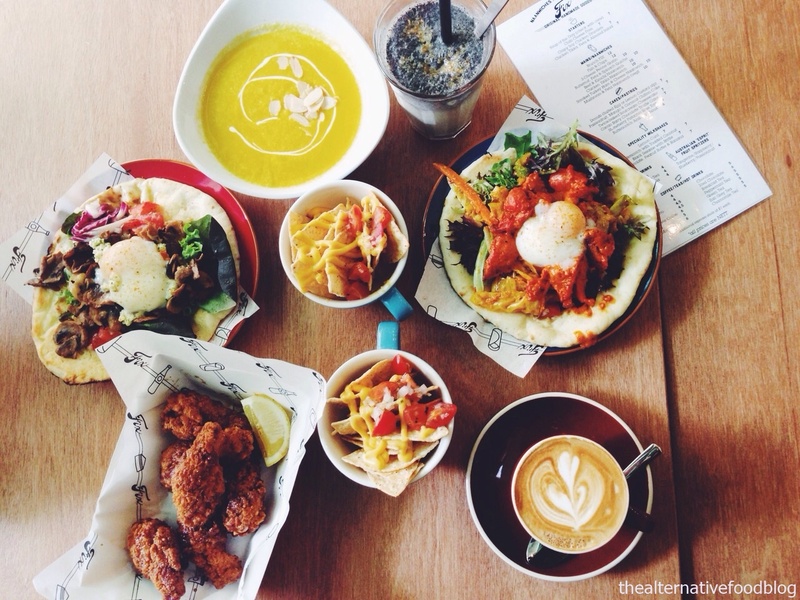 One of the things that Shereen often does is to scour the net for newly halal certified cafes for us to try. She recently stumbled upon Fix’s instagram and left them a message about their halal status and two weeks later, both of us were invited to their cafe for an interesting tasting session. Upon arrival at HOMETEAM NS, JOM Balestier, we were greeted by Maureen, who arranged for our food tasting, at the quiet cafe, which follows in Grub, its sister cafe’s footsteps to create an impression in the local cafe scene. 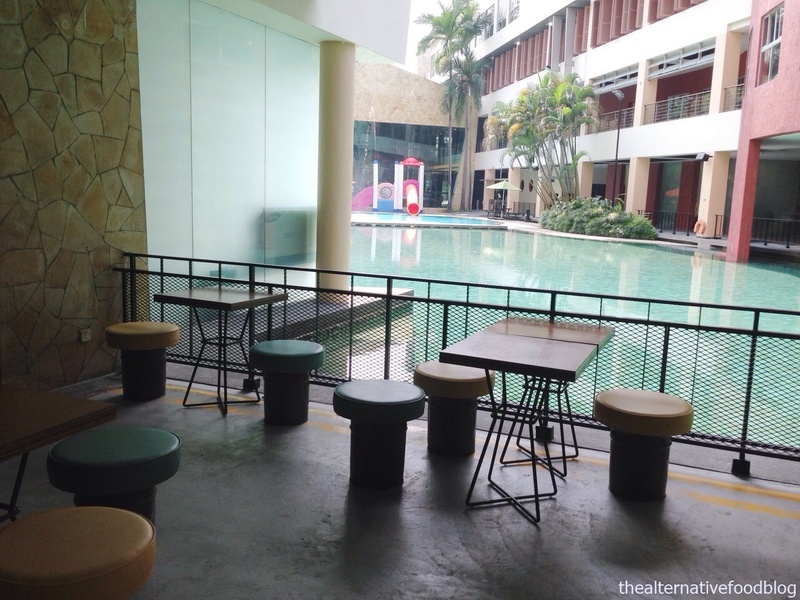 With Fix situated next to the club pool, and it having an open, workshop concept (which cleverly fits its Fix title); the café is well ventilated and certainly provides a spacious, no-frills dining experience. While we settled in and waited for our orders, we chatted with Maureen and over the course of our lunch, we learnt a few interesting facts about Fix. 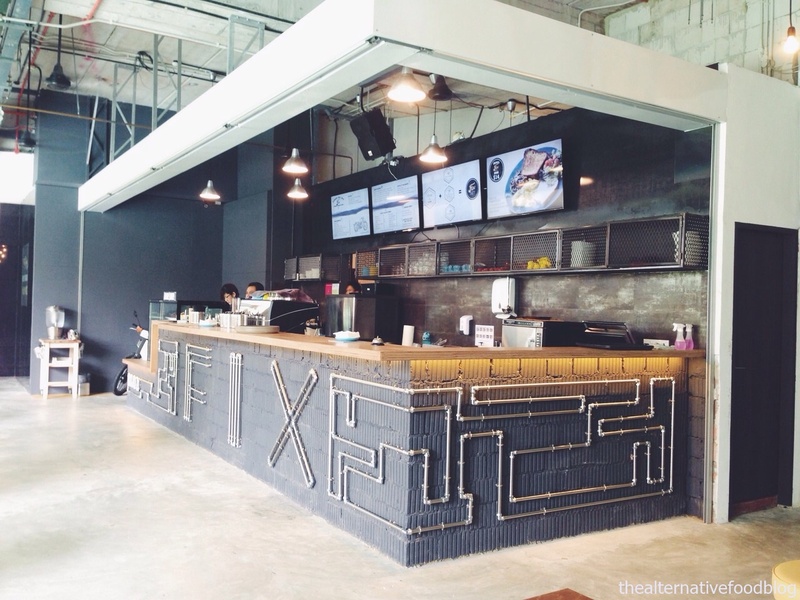 At Fix, food is seen as an agent of positive change, and they conceptualised Fix to be a cafe which not only provides a place for hungry customers to fill their stomachs with good food, but also a social enterprise that provides opportunities for youths at risk. According to Maureen, Fix has collaborated with skilled social workers to design training programmes for youths at risk where they are given work experience at the cafe and helped to get their life on track again. Shereen and I were very impressed with the training programme, and we thought it was wonderful of the owners to actively practice corporate social responsibility. Upon Maureen’s recommendations, we managed to try a large selection of items on the café’s menu. Between us, we shared the Crispy Soy Chicken Drumlets, Butternut, Feta & Spinach Quiche, Pumpkin Soup (which was the Soup of the Day), Chicken Tikka Naanwich, Mushroom and Feta Naanwich, and 3-Cheese Penne Gratin. The Pumpkin Soup (SGD 7.00) was the first dish I tried. Pumpkins are naturally sweet, and very often, pumpkin dishes are paired with savoury elements to provide a balance to the natural sweetness of this superfood. The taste of pumpkin is strong in the soup at Fix, however, it was too sweet for my liking. 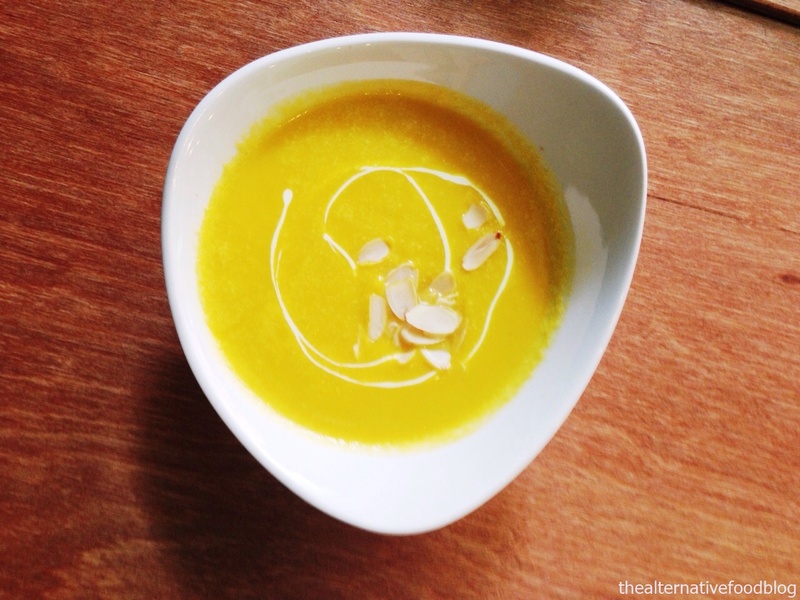 With the right balance of sweet and savoury, the pumpkin soup would have been a greater hit with me. 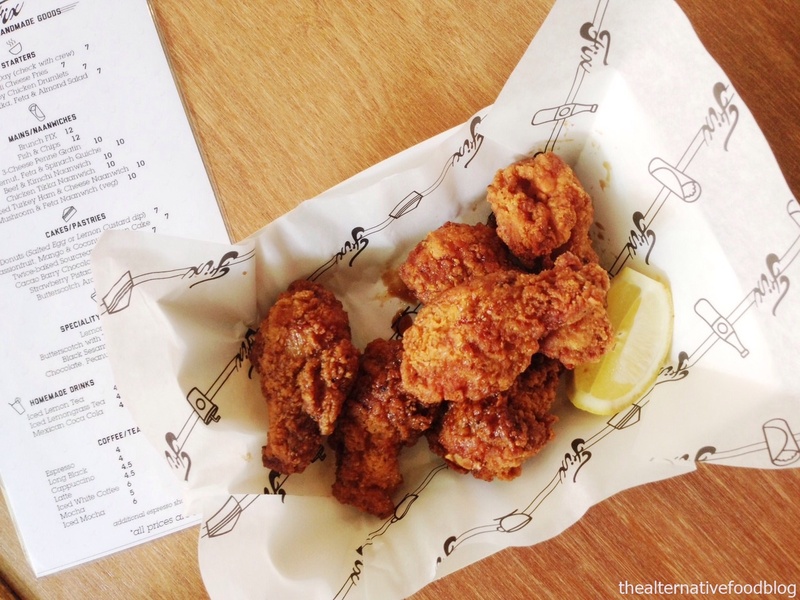 While I tasted the Pumpkin Soup, Shereen dug into her Crispy Soy Chicken Drumlets (SGD 7.00), served with a wedge of lemon. This side-dish comes highly recommended, and true enough, the drumlets were crispy on the outside, and juicy and tender inside. Shereen, who is not a big fan of chicken, was very impressed by how well the drumlets had been marinated and cooked to perfection. According to Shereen, the sauce which glazed the drumlets tasted sweet and spicy, and the squeeze of lemon provided another layer of flavour to the drumlets, giving it a taste that is similar to Mexican-style or even Korean-styled chicken. This side-dish was definitely her favourite of all the dishes. 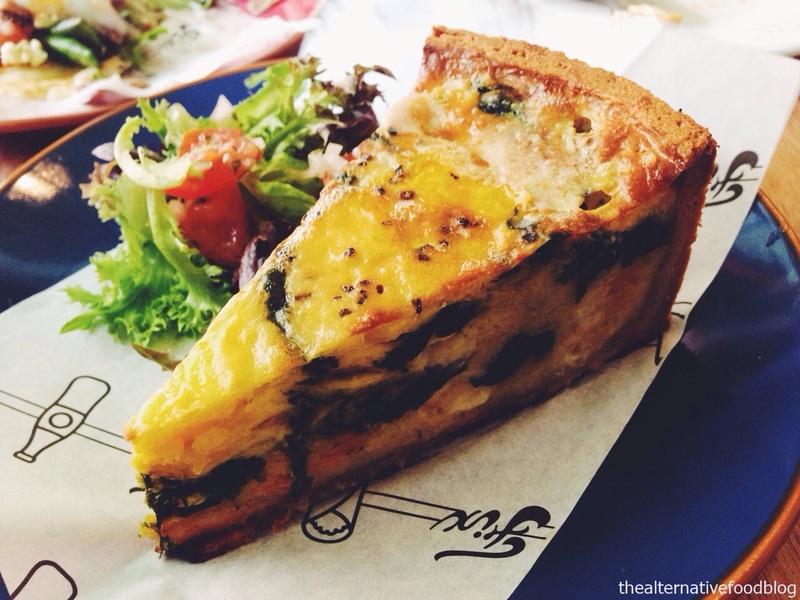 We also sampled the Butternut, Feta & Spinach Quiche (SGD 10.00) next. The main ingredients for most quiches are egg , milk, and for some, cheese which are combined to give this baked dish a creamy texture. For the quiche at Fix, the shortcrust pastry was buttery and although we could detect a slight burnt taste, I liked that it added texture to the dish. 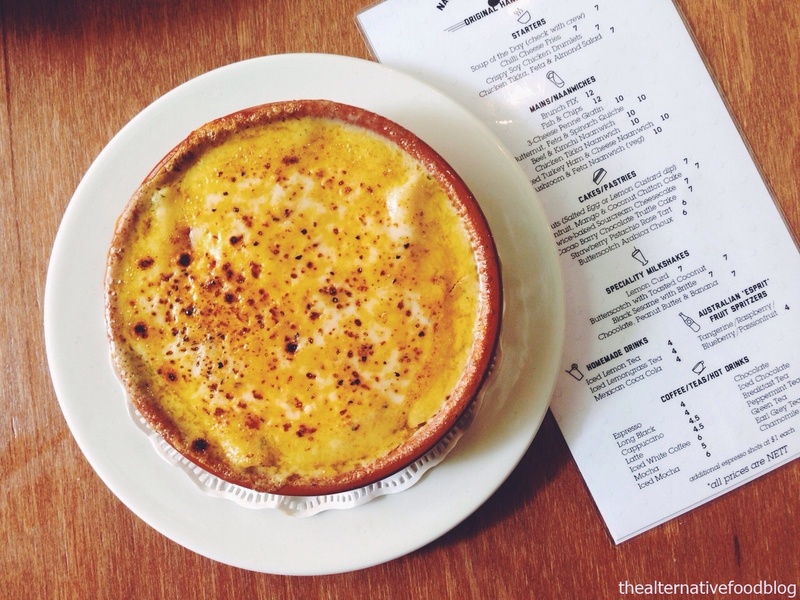 Unlike other quiches I’ve tasted, this quiche is a little dry and less creamy. We also noticed that the quiche is minimally seasoned and is not as rich as others we’ve had before. The firm filling reminds me of a frittata, which is also baked egg dish, but with less cream. The firm texture also meant that the quiche was filling, and could perhaps even be eaten as a main. 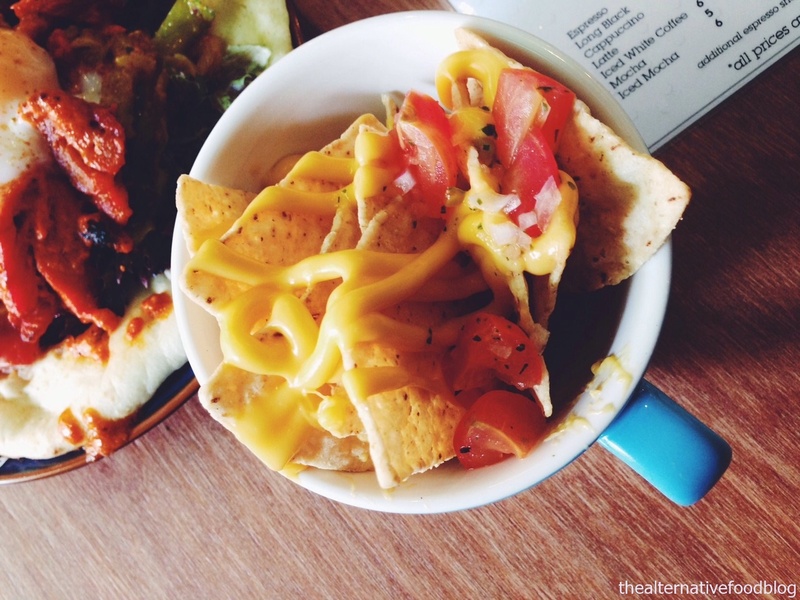 In between these bites of the various sides, we had mouthfuls of our Naanwiches that were served with a side of nachos with cheese and fresh salsa. As the name suggests, Naanwiches are made with naan bread instead of the more common ciabatta or panini. According to Maureen, the chefs experimented with the taste and textures of different breads before they came up with the Naanwich. However, unlike a most sandwiches which are closed, this one is open faced. Maureen explains that Fix does not own a tandoori oven and hence, they are working with an Indian restaurant for their supplies of the naan breads. The chicken, and the other meat fillings, she assures us, are prepared in-house, in their halal kitchen which is situated in another of their subsidiary, Cooky Inc that is right next to Fix itself. 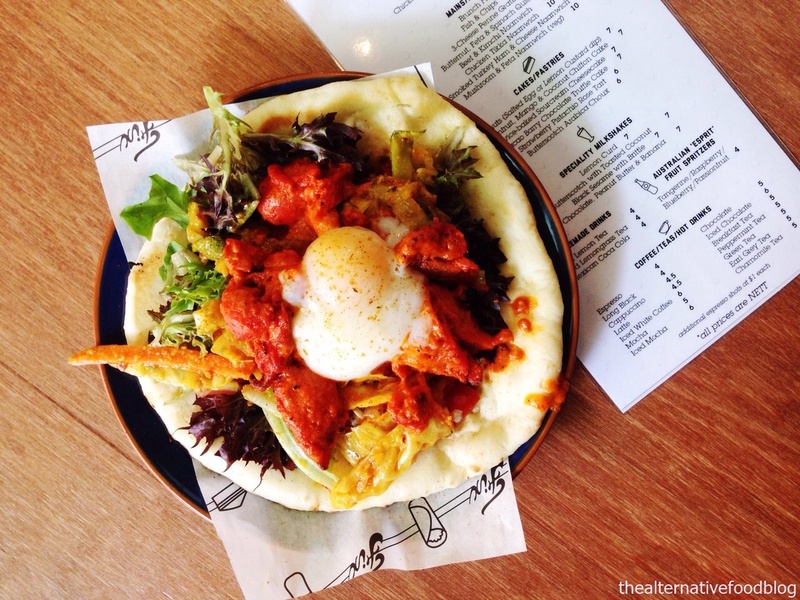 Shereen had the Chicken Tikka Naanwich(SGD 10.00) and she was impressed by its generous portion, and more importantly, the taste of the chicken tikka. According to her, the chicken is well marinated and cooked, and there was no overpowering poultry taste that she can sometimes taste in other chicken dishes. 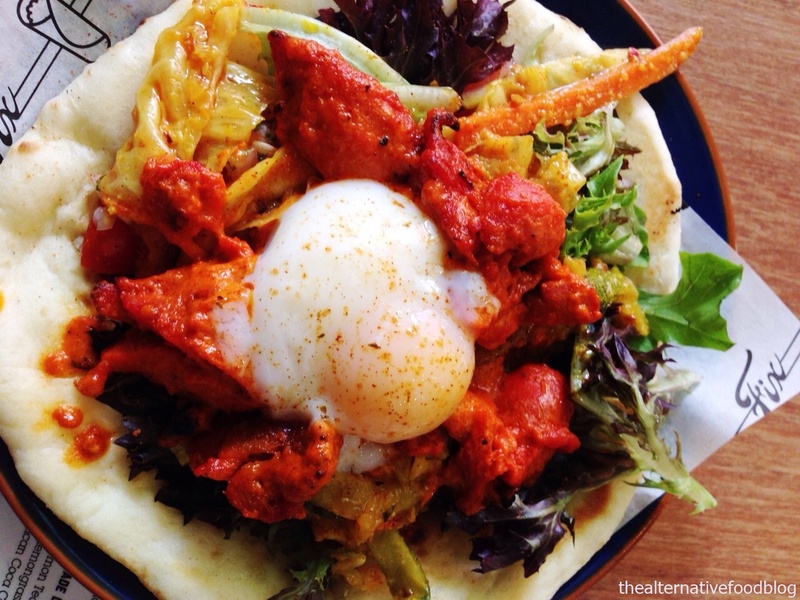 The chicken tikka is paired with some archar to provide a more local twist to the naanwich. However, Shereen wasn’t a fan of archar, and she would have preferred her naanwich without it. As for my Mushroom and Feta Naanwich (SGD 10.00), the naanwich filling was a generous portion of sautéed mushrooms, fresh salsa, and salad. The mushrooms were well-seasoned, and the fresh salsa provided a good balance to an otherwise savoury dish. The combination of bread, mushroom, and the half-boiled egg made this Naanwich a definite comfort food. If you are queasy about eating half-boiled egg, you can always make a request for the egg to be fully cooked.. 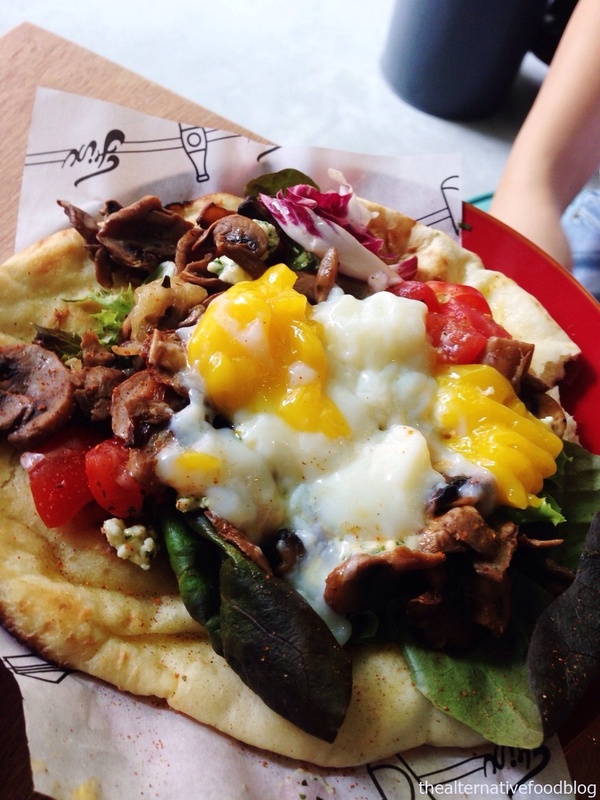 Overall, I felt that the Mushroom and Feta Naanwich could be a substitute for a breakfast or even brunch. The last main we had was the 3-Cheese Penne Gratin (SGD 10.00), baked with three cheeses – mozzarella, cheddar, and mascarpone. I have been trying to cut dairy products from my diet for a while, and I rarely eat cheese now so I was a little worried that the three cheeses Penne Gratin would be overpowering in taste. Truly, it was creamy and fragrant with the cheese, but not so overpowering to become cloying. Shereen and I, however, agree that the combination of the pasta and the triple cheeses made the dish very filling, which, rightfully as Maureen points out, is expected for a main dish. So fans of pasta and cheese, you will be in for a treat when you order the Penne Gratin at Fix. 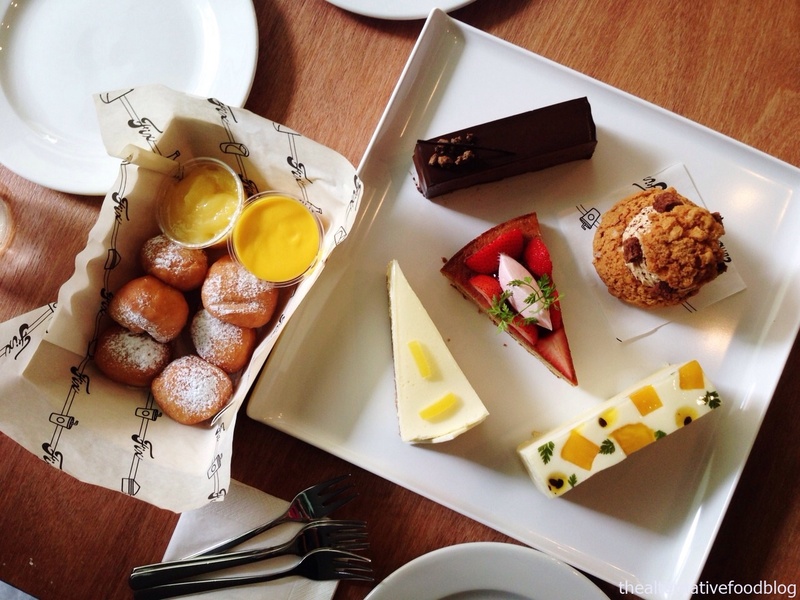 No meal is ever complete without desserts, regardless of how many mains you’ve tried and we were lucky enough to be treated to an assortment of desserts made by the bakers at Fix. From freshly made doughnuts to the ubiquitous chocolate cake, we were wowed by the selection of desserts available at the café. More often than not, most of the cafes we visited outsource their cakes from established bakers or cakeries. Hence, we were really impressed to learn that Fix has a team of bakers working with Michael, their dessert consultant, to create a dessert menu. 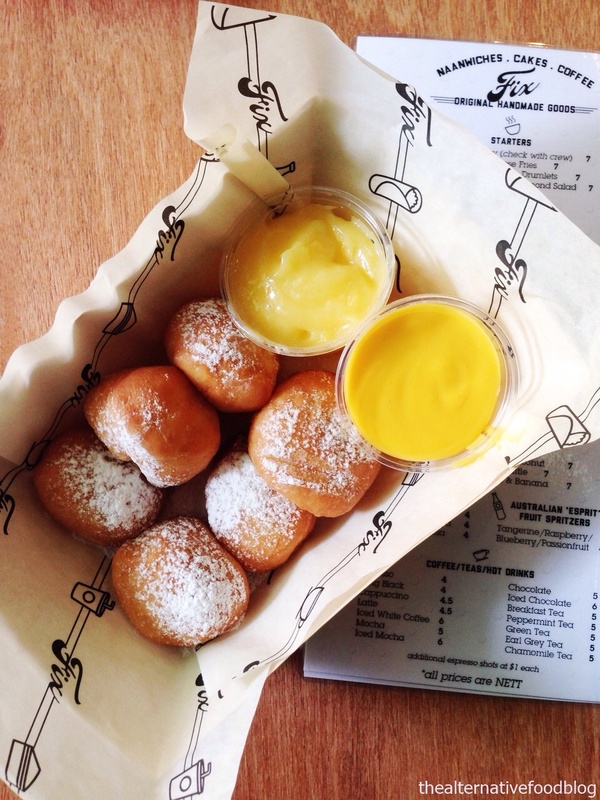 First up were the Donuts with Salted Egg or Lemon Custard Dip (SGD 7.00). Seeing we were dessert aficionados, Maureen made sure we got to taste both dips with our donuts. The mini donuts were soft and fluffy, and the light coat of sugar dust made them delicious on their own. The presentation of the donuts and their simple and straightforward taste reminded us of old school donuts we used to buy from neighbourhood bakeries. Needless to say, these donuts tasted even better with the dips. The Salted Egg dip is exactly what you will expect to find in a “liu sha bao” or what some of you may know as the Golden Sand bun. Shereen was very taken by the Salted Egg dip, and she even said she could drink the dip on its own! 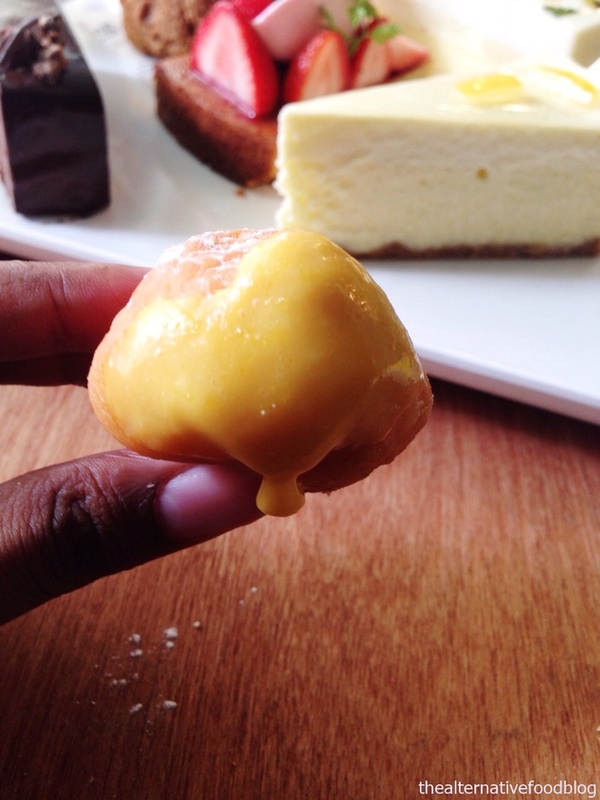 As for me, I preferred the Lemon Custard dip as I am a huge fan of sour and tangy desserts. The Lemon Custard dip was tangy, with a tinge of fresh lemon taste, and compared to the Salted Egg dip, it provides a more refreshing and lighter taste to the dessert. Do note that for a normal order, you’ll have to pick one dip to go with your donuts. We were soon joined by Michael, the leader of the pastry team, who kindly introduced us to his dessert creations. It was obvious that desserts are taken seriously at FIX – from idea generation to creation and even improvisation, we could tell that the cakes at Fix would be different from those we had tried in other cafes. 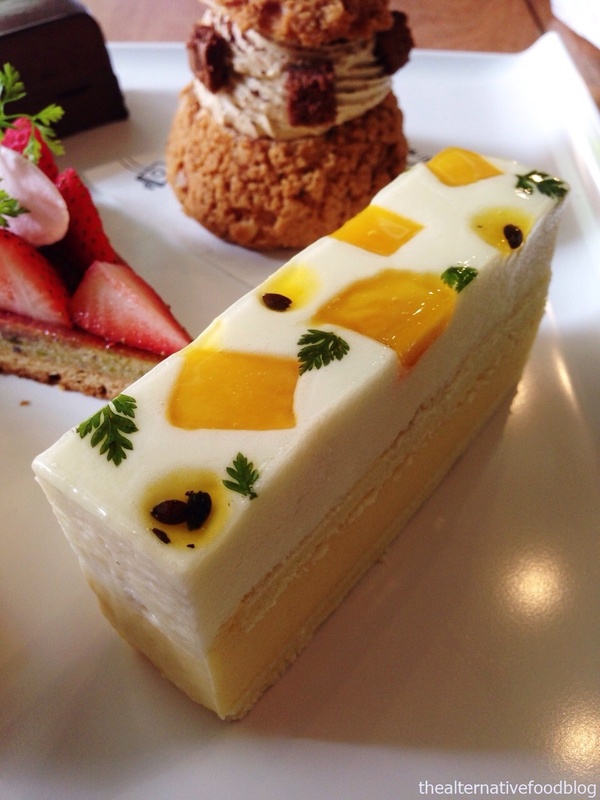 As advised by Michael, we started with the Passionfruit, Mango and Coconut Chiffon Cake (SGD 7.00) which was the lightest of the cake selection. The Passionfruit, Mango and Coconut Chiffon Cake is made up of primarily three different layers of fluffy and smooth chiffon cake, coconut meringue mousse, and passionfruit meringue mousse with fresh mango. The cake is best eaten by taking a bite of all the layers together, as the coconut meringue mousse – with a hint of pandan – marries the flavours of mango and passion fruit very well together. 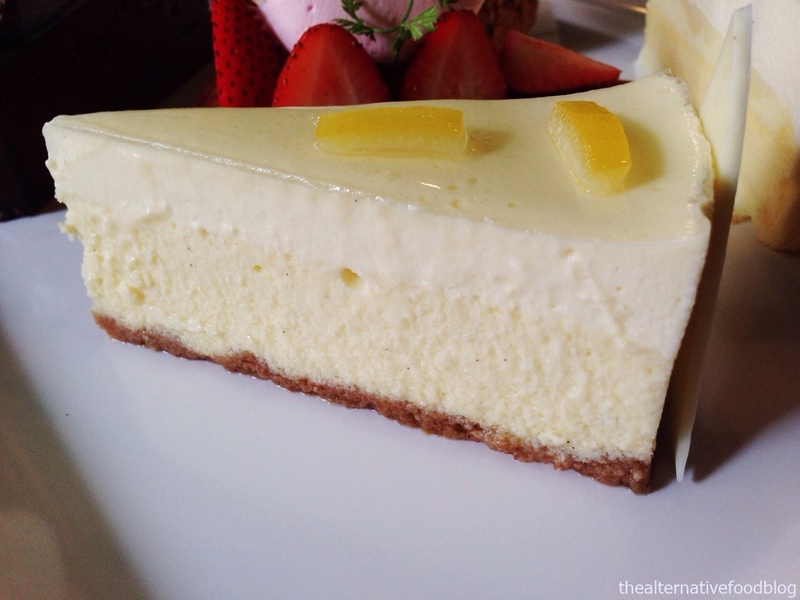 We then tried Fix’s own Twice-baked Sourcream Cheesecake. Michael explained to us that the Philadelphia-baked cheese cake is paired with a spiced graham biscuit base, and topped with sourcream and lemon confit to give the cheesecake its signature taste. Shereen however, found the cheesecake to be too sour for her liking. As for me, I liked how the graham base provides a balance in the texture of this cheesecake that resembles the taste and texture of a Chicago cheesecake. 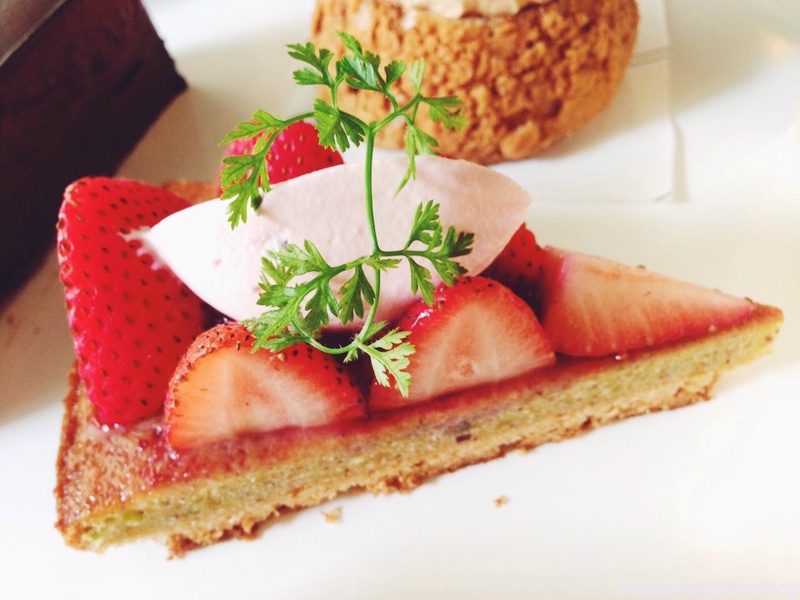 We also tried the Strawberry Pistachio Rose Tart (SGD 6.00) which looks as delicious as it tasted. The butter shortbread, with a raspberry coulis, is garnished with fresh strawberries and a small dollop of rose cream chantily. Pistachios that were added to the shortbread gave the tart a surprising crunch, and the nutty flavour complimented the raspberry coulis and the rose cream chantily. We unanimously agreed that this was our favourite dessert on the menu. What is a dessert menu without a chocolate cake? As Michael explains, a good café must have chocolate cake on the menu, and the Cacao Berry Chocolate Truffle Cake (SGD 7.00) at Fix is one you definitely need to try. Made with 70% dark chocolate, the Cacao Berry Chocolate Truffle Cake is more of a mousse cake, and it is certainly rich and velvety in taste. Shereen and I think that the cake is slightly similar to Guanaja from Rive Gauche but without its crunchy base. 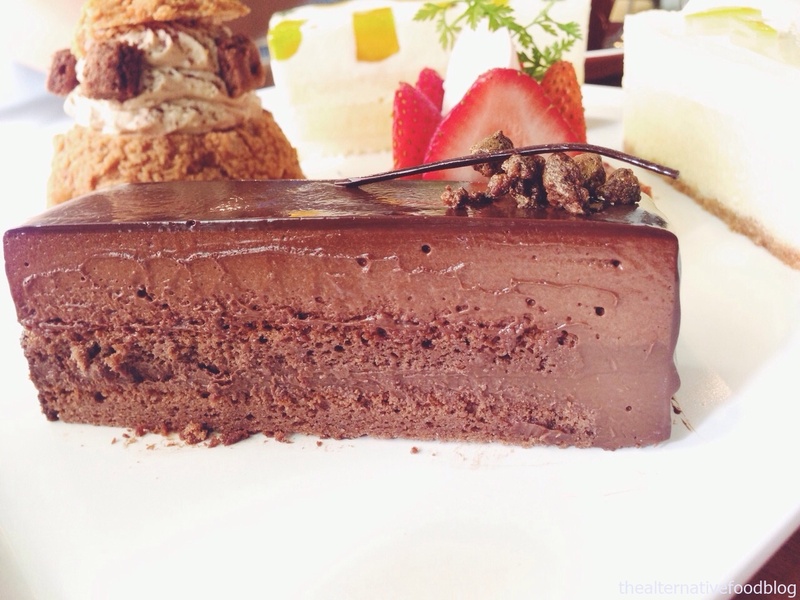 So fans of dark chocolate, and rich mousse cake, this is a cake you must order when you visit Fix. 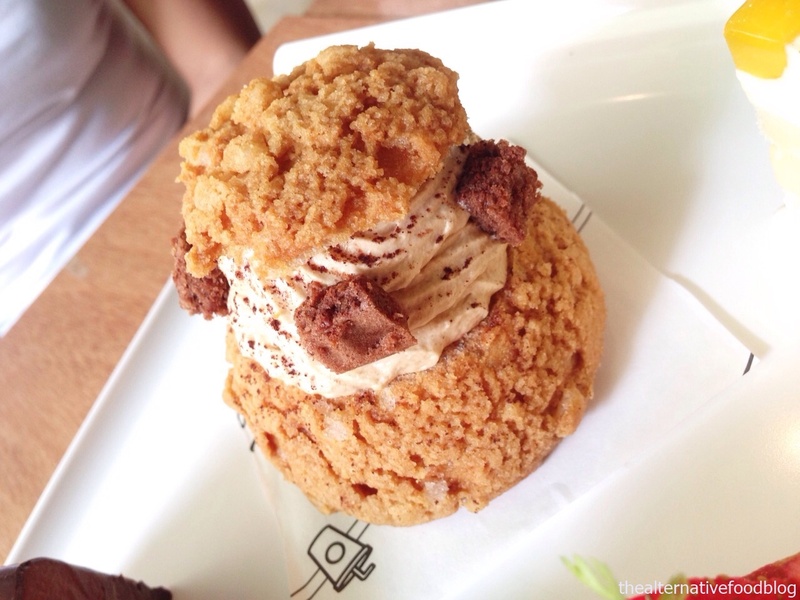 Finally, we ended the round of desserts with the Butterscotch Arabica Choux (SGD 6.00). The crunchy cookie choux was light and chewy and definitely well-baked for it to achieve the texture. The pastry is filled with a sticky butterscotch, coffee cream chantily, chocolate fudge, and a surprise center of chocolate cake. It is best eaten when you pull the puff apart to get into the filling. The puff reminded me of eating a huge toffee sweet, and if it weren’t for its huge portion, and the amount of savoury mains and cakes I ate before it, I would have finished it. Michael did ask us what we thought of the size and shared that they were thinking of making it smaller as well. And of course, no visit to the café is complete without tasting the coffee. Shereen had a Latte (SGD 4.50), while I had a Cappuccino (SGD 4.50). We were impressed with our coffee, as they were well prepared, and the coffee was robust without any acidic or sourish taste. Also, we were told that the coffee beans used at Fix are halal beans, which is something not commonly heard of in the local café scene. 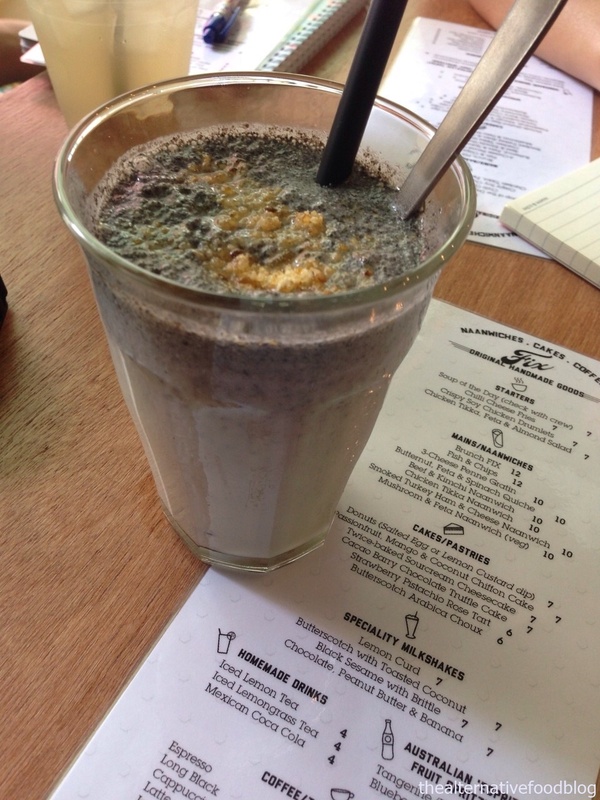 Also, we managed to try some of Fix’s signature milkshakes. Shereen ordered a Black Sesame with Brittle Milkshake (SGD 7.00) while I ordered a Lemon Curd Milkshake (SGD 7.00), both at Maureen’s recommendation. Shereen enjoyed her Black Sesame with Brittle, and according to her, the black sesame paste is not blended completely into the ice cream, and it does not have an overpowering taste, thus she feels that it would be a good starter beverage for someone who has never tried black sesame before. As for me, I was very impressed with the taste of my Lemon Curd Milkshake. Noticing how I prefer sour desserts, Maureen suggested that I should give the milkshake a try. At the first sip, my eyes widened as it was slightly sour and tangy, with a lemony zing that helps to balance out the heaviness of an ice cream milkshake. The combination of lemon and ice cream reminded me of the lemon cream filling in old school lemon biscuits. Truly, Shereen and I probably have never been that full at the end of a cafe session but we had lots to be thankful for. The unique naanwiches, the robust coffee, the tantalizing desserts, along with the dedicated efforts of the owners to facilitate positive change, made our visit to Fix a truly unforgettable one. In fact, we are already looking forward to returning to Fix for another round of cakes and donuts again. 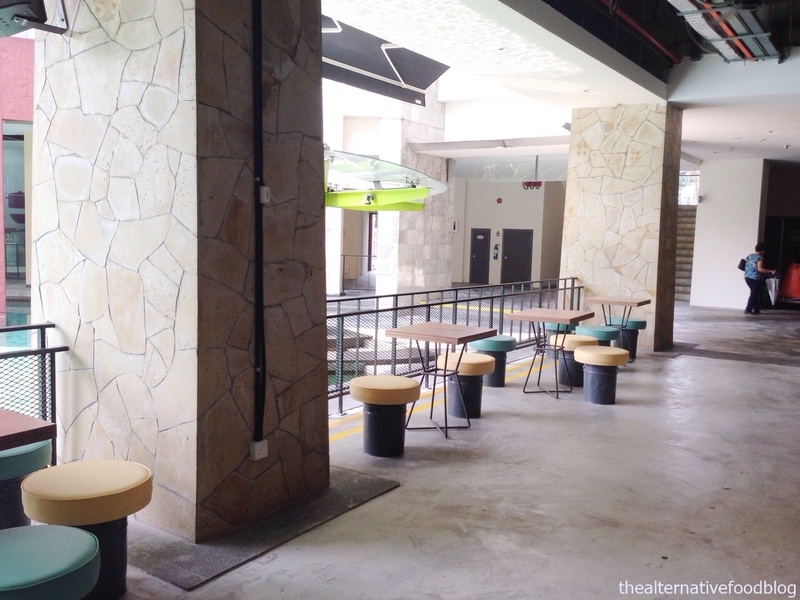 How to get there: Nearest Train Station: Toa Payoh MRT Station. Buses to the vicinity: 8, 26, 28, 31, 57, 59, 73, 88, 90, 142, 142, 155, 157, 159, and 163. Halal Status: Currently in the process of Halal certification. (Maureen informed us that even the cutleries and crockery used at Fix are strictly sorted from those used in the adjacent Cookyn Inc). Our Verdict: ♡ ♡ ♡ / ♡ ♡ ♡ ♡ ♡ (3.5 out of 5 hearts). Naanwich!! That’s so unique and looks absolutely delish 🙂 amazing photos!